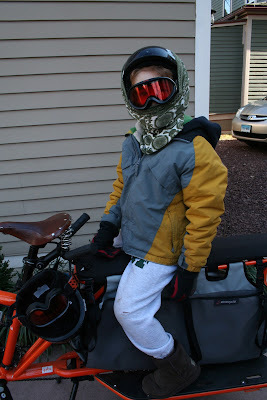 when we ride our bikes. We continue to be excited by Liz Canning's crowd-sourced cargo bike documentary, (R)Evolutions per Minute. After months of thinking about it, but not doing anything about it, we finally got a move on this weekend to do some cargo bike filming. Most exciting, a friend who is a filmmaker kindly volunteered two hours of her time and came over Sunday to film some short interviews we conducted with local cargo-bike-riding families. Then, one of these folks passed along a mount for a Flip video camera which we could velcro to our handlebars to try and capture some riding footage. We gave it a go the next day as we rode downtown together. I rode the Xtracycle, one son on the back, the camera mounted on my handlebars, capturing P in front of me with our two other fellas on the Yuba. The quality of this video is pretty weak (don't get sick from the shakiness), BUT it does show the ease in which my boys ride on the back of our bikes, interacting with each other and the world around them. "And polar bears are EPIC!" Hats off to Kona Bikes for this well-done short bike documentary How Bikes Many Cities Cool -- Portland. Inspiring, and envy-producing for those of us who don't live in PDX, this video captures the incredible spirit of how bikes add to city-living. I particularly love all the kids' comments and contributions, from noticing the birds to helping family finances by saving money on gas to.... Well, just watch it and see. Portland - Mini doc from Kona Bikes on Vimeo. It is always exciting to learn about other's adventures. We recently learned about a wonderfully cool project through Kickstarter. Amie from Seattle, Washington and Olli from Helsinki, Finland have set out on a bike ride across Europe and Asia. They plan on sharing meals and chatting with others along the way. Really, what a great combination: bikes, travel, stories, and food! You can find their blog here. See photos of folks they meet and the meals they share and read their stories. Yes, the Full Hands is still here and still bicycling despite our poor posting these past months. As the weather turns warmer 'round these parts and there are loads more bikes out on the streets, I found these photos from a cold weather ride. 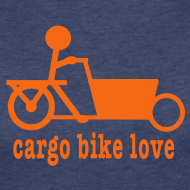 A small t-shirt venture featuring cargo bike designs: longtails, Madsens, bakfietsen, & cargo trikes. You choose shirt color and size.